Attendance is up (just), traditional entries are down. Arif Durrani on this year's trends. 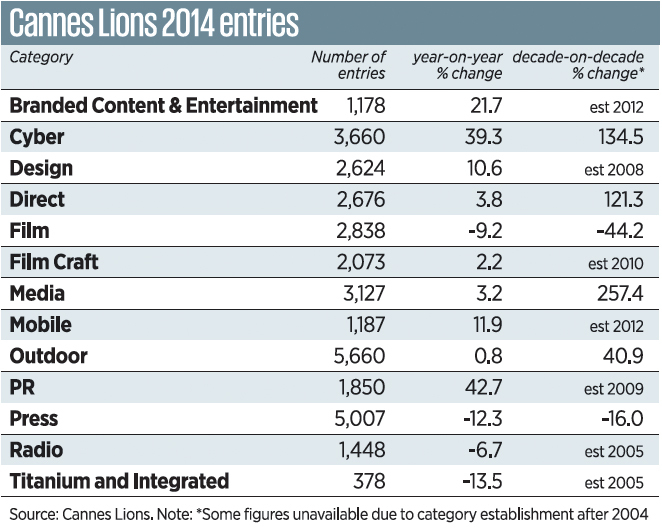 Cannes provides the ideal backdrop to take stock of where media finds itself in 2014. Some 12,500 delegates are expected to attend – and that figure doubles if you include those not officially registered. It’s an increase on last year’s attendance, but only a slight one. Historically, Brazil has been one of the best-represented countries at the event, responsible for around 10 per cent of delegates. Unsurprisingly, with the World Cup taking place in football’s spiritual home, numbers from both Brazil and the wider South America region are down this year. Delegates from media and tech companies account for roughly 2,500 registrations – some 20 per cent of footfall. One thing the media contingent need not worry about is being the new boys. Expect those wandering wide-eyed into the Palais in 2014 to be from PR, after a 43 per cent leap in entries for PR Lions. Two key factors driving PR executives to the event have strong reverberations in media too: the rise of earned media and branded content. 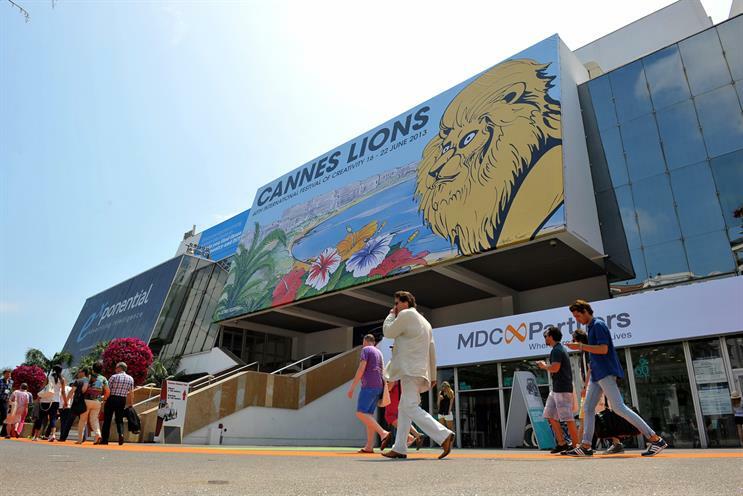 Although it is hard to take one year’s data as a trend, Philip Thomas, the chief executive of Lions Festivals, says entries reflect the sectors agencies are keen to demonstrate they are good at: "Earned media is an area clients are really interested in, and to prove your mettle in the space is a good thing for many agencies." In this context, it is worth noting the decline in entries for most traditional cate­gories this year (Press: a drop of 12 per cent; Film: 9 per cent; Radio: 7 per cent), with only Outdoor recording a rise (of less than 1 per cent). In contrast, interest in Cyber, encompassing branded online, digital and technological communication, has rocketed 39 per cent. Another trend that will be reflected this year is the growing importance of data in the creative mix. For a powerful example of how creativity in media can be about simple, collaborative ideas that use real-time insights in a different and more effective way, look no further than last year’s only gold Media Lion winner from the UK. Mindshare’s work for Kimberly-Clark analysed search trends on Google to mesh key words relating to colds and flu with calls to government health helplines. The model allowed Kleenex to predict flu outbreaks at city level in real time. Media activity was then focused on cities experiencing outbreaks as they happened, while preventing media spend being wasted in flu-free zones. Such insights position media agencies closer than ever to creative output. Thomas, mindful that creativity is the fundamental building block upon which the festival is built, admits they thought long and hard about making data such a big play in 2014. "Our critical point is: we will never do anything at Cannes that didn’t ultimately result in a better idea," he says. 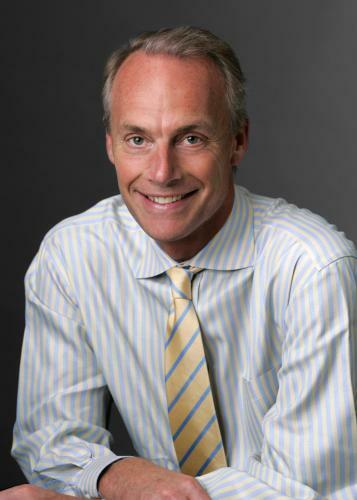 The president of the Media jury this year is IPG Mediabrands’ global chief executive, Matt Seiler. He brings an interesting perspective to the equation, having famously set a goal for Mediabrands agencies (UM, Initiative and BPN) to automate 50 per cent of all media buying in the US by 2015. The agencies are said to be on track, and the goal has since been extended for the entire G14 region to hit the 50 per cent mark by 2017, the UK included. Seiler believes a programmatic revolution is now under way, offering "smarter, faster decisions". He adds: "There is no idea as powerful as one whose time has come, and the time has come for automation in the media industry. It is not only the right thing to do, but it is inevitable." Another salient trend this year is the continued rise in attendance from clients – who now account for around a quarter of all registrations. Seiler is among the growing wave of progressives who believe media agencies should now be positioning themselves as an extension of a client’s marketing department. He says agencies should move beyond planning and buying media and delivering gross rating points to solely focus on selling more of a client’s product. He notes the automation of the business will only help build the case for pay-for-performance models. This year’s festival is set to cover a lot of ground. Consensus will not always be found, but it promises some lively debate. Is there still room for creativity in the media industry?